One of the restaurants I like to go to is Firebirds Wood Fired Grill. When it comes to steak battle, Firebirds Wood Fired Grill wins over Bonefish Grill hands down, and for seafood/fish dishes and sauce creativity, Bonefish Grill is better.However, both great restaurants to check out if you have never visited them. Anyway, almost all restaurant except Asian restaurants, serve the bread to start with. For example, Bonefish Grill serves crusty artisan bread with basil pest dipping sauce, Outback steakhouse serves the bread with whipped butter, Olive Garden serve the garlic bread, Firebirds woodfired grill serves semolina bread with whipped butter. 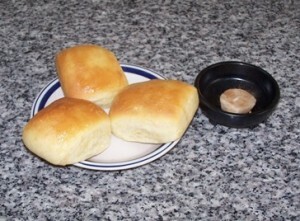 Me and my husband loves Firebirds’ bread.Therefore, I thought I would make one for us too,to try. Maybe their bread is a touch softer inside,which makes me wonder if they use milk instead of water or combine all purpose flour or bread flour and semolina flour, but mine was tasty enough. I would like to share the recipe with you. I do love bread baking. For me, bread baking is like comforting in many ways from kneading the dough, aroma while bread is being proofed or being baked,sound of crust when you slice into the bread.. There is something about bread baking that makes the whole experience special. ** water temperature to rise the dough (proof the dough) should be at 110F-115F. 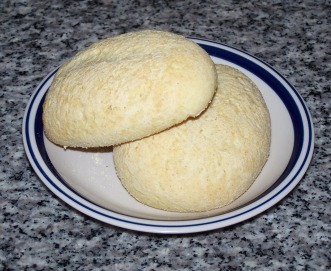 Lower temperature water would not proof the dough properly, and higher temperature water would kill the yeast and would not proof the dough properly. 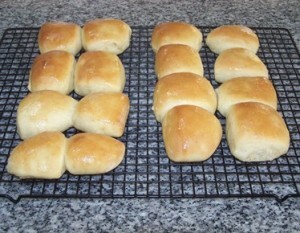 5.You can test your dough to see if you knead it more. Do the Windowpane test. 15. Bake them for about 8 minutes,and rotate the sheet pan to continue baking for another 9 minutes.Then,continue baking until bread sounds hollow when tapped. As you already know, I like re-creating meals from restaurants or eatery places that I have visited. It is fun to brain storming what is in the dishes I like. One of the restaurants I like to go to is Bonefish Grill. Some of the reasons I go there are for their bang bang shrimp (spicy shrimp tempura in chili flavored sauce), Crab chowder, Bacon wrapped sea scallop, and more. I like their seafood dishes because they do pretty good with fish dish. Many restaurants has fish dishes on the menu but,they tend to overcook the fish and, I do not care for as much as the fish dishes from this Bonefish restaurants. 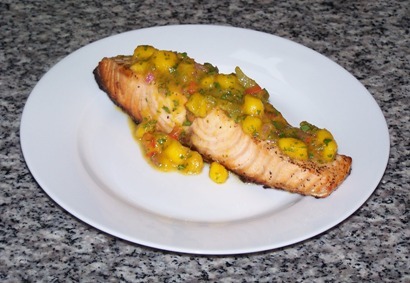 In the past, I have attempted to recreate the bacon wrapped scallops with spicy mango salsa (You can see the recipe here), but I could not figure out how they wrap the bacon around the scallops so, I have left it out for the dish. However,this time around, as second attempt, I think I came to a little closer to what it is served at the restaurant although since I wanted to explore the other kind of great sauce, I have made up the different sauce to go with the dish. My suspicion as to why their bacon wrapped around the scallops comes out so crispy and scallops stay so tender and juicy is that, I think the key is in the thickness of the bacon (very thin bacon strip) ,and deep frying them. To make the crispiest bacon you have ever tasted, you should deep frying the bacon strip.It never comes out greasy at all and, very very crunchy. If you make burger next time, try deep frying the bacon and see how it comes out.You will be surprised the bacon is really,really crispy. In this entry, I would like to share the recipe of Bacon wrapped scallops with garlic sweet chili lime sauce as my second version of their dish. With my version, I will use the marinade that I normally use for shrimp preparation because it makes super tender in its texture and they are tasty. 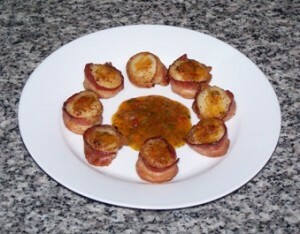 Bacon wrapped scallops with garlic sweet chili lime sauce..
3. Rinse the scallops well under cold running water and pat them dry with paper towel and follow the recipe. 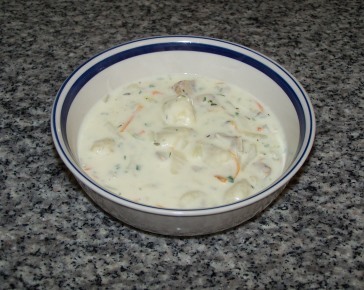 ** When you cook scallop, pick the sea scallops, not bay scallop. ** When you purchase scallops on the fish counter, you may sometimes see rose pink colored scallops and pale white scallops. Do you know the difference between the two? It is the difference between if the scallops are treated with STP (sodium triphostate), sulfite or not. STP or Sulfite is sodium preservatives to keep the moisture in the seafood products such as scallops, shrimps and makes the shelf life longer. Often times, STP treated scallops are pale white and if you test with microwave; place a scallop on the paper towel and microwave it for 15 seconds and you will see a lot of water will be coming out from the scallops. Rose pink scallop is not treated with STP and it would not give out as much water as STP treated scallops if you do the microwave test. This is something I learned from America’s Test kitchen TV shows. I think this is good thing to keep in mind. Therefore, I personally prefer to have food preservative free so, I pick the rosey pink scallops over pale white scallops. ** When you cook scallop, a few things to consider. 1. Make sure scallop is fully thawed, marinaded in the recipe above and be at the room temperature. This same rule applies to cook steaks too. 2. Make sure scallop is not wet. When I cook scallop, I usually place a paper towel over the plate and place scallop on top and place another piece of paper towel to take moisture out from the scallop. By cooking moisture free scallop, you can cook scallop with nice seared mark on it.If the scallop was wet,you would not get any seared mark. 3.Season the scallops right before you place the scallops on the skillet. 4. Make sure the skillet is hot enough. 1.Cut one strip of bacon into half per scallop you use. I usually make 3 -4 scallops per serving. So far, the best dish I have eaten there would be “Rhea’s Icelandic Arctic char; wood grilled and topped with sauteed spinach,lump crab,and lime tomato garlic sauce”,which is on May special menu. I think it is a seasonal dish and,I cannot get it all the time but when they have one, it is the dish I would order. Arctic char is meaty fish with mild taste of.. cross between salmon and trout and, I really like them. Even my husband,who is not a big fan of fish said he could eat it because it was not tasting fishy at all. I love salmon, and Arctic char dishes served there. Many restaurants have Grilled fish on the menu but, many of them tend to serve over cooked dry fish or under or over seasoned fish. However, their fish is beautifully cooked without over cooked, and they are juicy and moist with a bit of char on the fish. They really do good on seafood menu. Anyway, the Bonefish Grill has interesting side dish (cold dish) on the menu called “Lemon kissed Quinoa”. It got red quinoa,lemon, olive oil,tomato etc.. and, when my husband ordered it, I got to taste test some of their Quinoa dish and I thought it was tasty. Also, my husband who does not like raw tomato, raw cucumber could eat it without any problems and loved the dish.Therefore, I thought I would recreating the dish so we can serve at home as well. 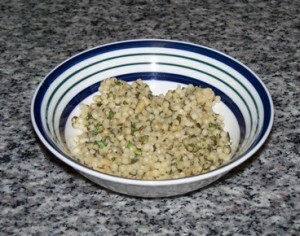 Then,recently, I have tried recreating the Quinoa dish from Bonefish Grill restaurant and I think it came out pretty close. Since I like more lemon taste in mine, mine is has more citrus flavor to it,but it came out great and my husband ate it all.Nothing left on his plate:-) He loved it. 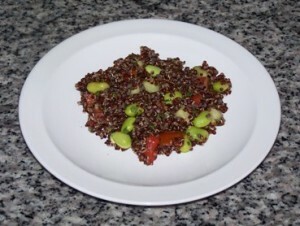 Lemon kissed Quinoa “Yassy’s version”.. If you ask my husband what kinds of steaks he likes best, answer will be grilled steak. It is either thick cut of juicy medium rare fillet, or thinly sliced flavorful flank steak. He likes various types of sauce to go with it from garlic cracked black pepper corn sauce (You can find the recipe here), Gorgonzola dolce sauce (Recipe here), citrus teriyaki sauce (recipe here) etc..
We do not order steak anymore at one of our favorite restaurants “Bonefish grill”, but in the past, we have enjoyed Bonefish Grill’s steak with gorgonzola butter on it. We liked the steak a lot with the gorgonzola butter on top of the steak but, problem was that the butter was cold and not melted all the way when dish was brought to the table, plus it was too much butter on the steak and, I started making the recreated dish of theirs at home. Recreating the restaurant dish is always fun thing to do because guessing the ingredients are fun, and building your own taste is fun too, and when I could make good one with my twist, sometimes, my husband comments “I like yours better”,which puts a huge smile on me. Unfortunately, since I am expecting, I cannot enjoy the taste of soft cheese like gorgonzola cheese for now, but I used to make herbed gorgonzola butter ,which my husband loved them very much. I have so far 2 version of herbed gorgonzola butter sauce. So,I thought, I would share the 2 version of the herbed gorgonzola butter recipes for the steak plus Bonefish grill’s side dishes; “Garbanzo bean with spinach” , “Succotash”, and “herbed Jasmin rice”. You can have your own “Bonefish grill dinner night” too! My version of bean dish is much more saucy. I am fine with how they are cooked with the bean dish, but , the other day, when we visited their restaurant to enjoy seafood dish, our server told us that the bean side dish tends to be “iffy” among diners,and she was asking if it is ok with the meal we ordered. His comment made me happy, but if I had to guess, diners might be “iffy” with their bean side dish because their bean dish is rather dry. Anyway, when I went to grocery store, I found out that our grocery store carry Gorgonzola Dolce. It is a Gorgonzola cheese imported from Italy, and Dolce is creamier,milder,and not as tangy as regular Gorgonzola cheese, and easy to melt into the sauce so, I decided to use the Gorgonzola Dolce cheese for one of the herbed gorgonzola butter sauce recipe. However, regular gorgonzola cheese works just fine. Herbed Gorgonzola butter with succotash, spicy garbanzo bean, and lemon herb rice..
Next time,you want to use it,all you need to do is to take it out from freezer when you cook the steak, and by the time steak is cooked and everything, Gorgonzola butter will be soft enough to slice. 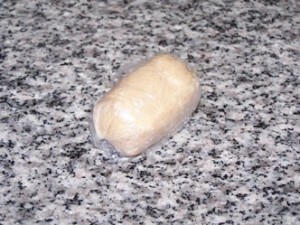 ** I usually wrap the Gorgonzola butter log again like a candy, and put it in the freezer bag and freeze it. ** For medium,130F-135F is the temperature to take the steak out from the skillet. have visited. It is fun to brain storming what is in the dishes I like. If I had to pick the type of dish they do good on, then, probably salmon, shrimp,and scallops dishes. Just recently,I have visited the restaurant and, I have ordered Grilled Arctic char topped with sauteed spinach and lump crab meat served with Lime Tomato garlic sauce. It was on special menu, and even though I was not sure if I like the Arctic char or not,I tried them. The dish was great. The server explained that the fish “Arctic Char is mild fish with taste cross between trout and salmon.”. The color of the fish was pink/orange color like salmon and, to me, it tasted sweet,mild,very tender flaky salmon. Wikipedia site says the fish “Arctic char” is salmon family, and has close fat content to sock eye salmon. I loved them. If you love salmon, you would love the fish. I hope they will keep the menu in the regular menu.I loved them that much. Palette the Corgi had a little bit of Arctic char nibble and she went crazy for it too. She loves seafood, just like me. When you visit the restaurant, and look around, many table has their famous shrimp dish called “bang bang shrimp”. I like their bang bang shrimp,too. Only problem that I find is that they plate the hot shrimp over lettuce and, the bed of lettuce gets wilted by the time we get close to them. Therefore,while I think lettuce has great color to use as garnish to make the shrimp stand out, I think it would have bee better if the lettuce was plated on side instead of being plated as bed for the star of the dish. That way, diners can enjoy lettuce with the same tasty dish without removing wilted warm lettuce from the plate. If you are not familiar with bang bang shrimp, “Bang Bang shrimp” is the shrimp dish where tender shrimps are deep fried and coated with spicy creamy sauce. Recently, I tried re-creating their bang bang shrimp to see if I can make it as close as theirs taste wise, and possibly can make it as main meal by adding vegetables to it. I wanted to use the flavor but wanted more healthier,substantial meal people can enjoy for dinner. Overall,I think I came to close although maybe breading is different. 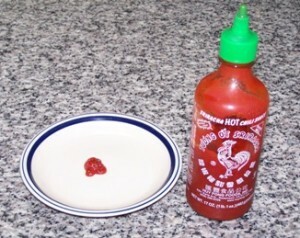 Maybe if you tone it down a notch of sweet chili sauce, and Sriracha, the sauce I made might be close enough to Outback steakhouse’s seared Ahi Tuna dipping sauce “Creamy soy- ginger sauce” as well. My husband thinks that their breading might be ground rice puff,but we will see. We will try his idea next time. Unfried Shrimp with creamy sweet chili sauce..
them in the refrigerator for 3-4 hours. it as your recipe instructs you for the dish you will be making. tomato paste if you will. Asian stores, they should carry the condiment as well. ** If you like, at the very end, you can add a drip of sesame oil as well.This is optional. My husband suggested that this dish may go well with coconut rice. I agree with that. If you like to make coconut rice, here is how you make it.